Description: Q615 swings by on the main line while A741 with the normal power of a B30-7 glides up the siding to the north to finish the days work. 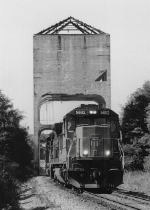 Description: Q615 passes under the former A&WP coal tower which was the first one south of Atlanta. The fromer Central of Georgia dimond is out of site just behind (to the north) of the tower.